Recently, I found myself thinking about the first time that I really understood that Jesus is present in the Eucharist. 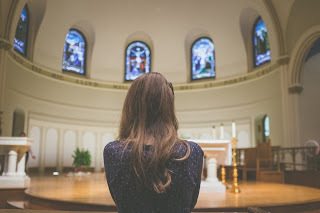 Before receiving the sacrament of my first Holy Communion I remember after mass one day my mother decided it was time that I really understand what was happening during the mass, and although she could have explained it to me she insisted that I should learn from the priest. My mother wanted me to truly understand the sacrament, and to be able to realize the incredible gift that I would be receiving on the day of my first Holy Communion; Jesus in the Eucharist. I remember how delighted the priest was to oblige to my mother's request when she asked him after mass that day. He took my hand and walked me to the altar, where I stared up at this beautiful, marble structure. He picked up his chalice and pointed to the stones on the side of it, which were his mother and grandmother's stones from their engagement rings. Father told me it was a special chalice that was used to hold the precious blood of Christ. I remember not saying a word, and I must have been trying to make sense of it in the best way that I could make sense of it as a six year old. Then he guided me towards the tabernacle and pointed to it, kneeling down beside me and asked, "Do you know WHO is in there?" I remember staying silent for a moment, then telling him that I knew the hosts were in there, and he smiled at me. Then he said, "Yes, but WHO is in there?" This time I recall just staring at the tabernacle with my eyes fixated on the golden structure, until finally he pointed again, and said, "JESUS is in there, JESUS is in that tabernacle". I was completely and totally awed by these words, and my life was never the same after that day. As a young child I always tried to have my mother stay longer at the Church after mass. I would always ask, "We're going to the Madonna room, right"? It was this beautiful, blue room with images and statues of Our Lady with an area that overlooked the altar. I would kneel by the area that overlooked the altar and watch the sacristan clean up after mass and just stare at the tabernacle. I was deeply intrigued, and knew even at that young age I wanted to be close to Jesus. 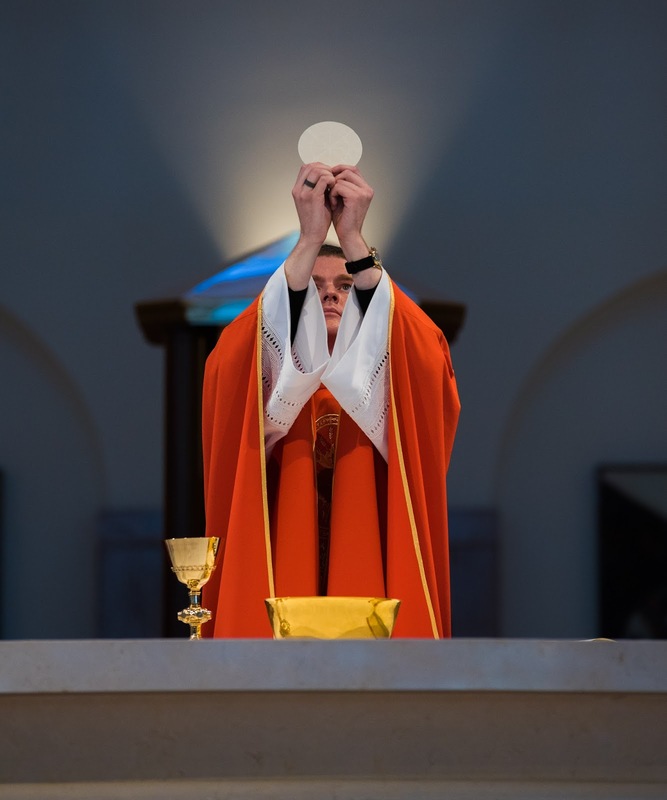 If you know Jesus is present in the Eucharist how can you willingly give up that truth? Once you know we as Catholics believe in the real presence how can you dismiss it? Jesus, actually gives himself in body, blood, soul, and divinity to us in the Eucharist. During the holy sacrifice of the mass the priest actually consecrates the bread and wine to become the body and blood of Christ. Jesus wants us to receive the precious graces that come to us through reception of Holy Communion. He wants us to want him, and in every tabernacle around the world Jesus is waiting for us. He's really there, present to us in the Eucharist. How amazing is it that the Son of God is present here with us on this earth in the Eucharist? Through Holy Communion in the Catholic Church we are able to receive Jesus who unites us into an even deeper relationship with the Father and the Holy Spirit. The amount of love that Jesus has for us is love beyond words because the gift of himself in the Eucharist I mean how can we even begin to describe his relationship with us? How do I begin to describe my relationship with Jesus? In that tiny host holds the most profound love imaginable that the gift of the priesthood brings to us during every single Catholic mass. A Catholic priest 'in persona Christi' is given the power by the holy spirit to bring to us Jesus in the Eucharist. How absolutely amazing is that? Seriously, doesn't that just blow your mind? We as Catholics are united together at the table of the Lord by receiving the flesh and blood of Christ. The Eucharist conquers division and brings us together as One, Holy, Catholic, and Apostolic Church. We may never meet one another in person, but by receiving Holy Communion we become united as brothers and sisters in Christ, and we are all a part of one Catholic family. I hope to see you all in the Eucharist. "I am the living bread that came down out of heaven; if anyone eats of this bread, he will live forever; and the bread also which I will give for the life of the world is my flesh".